Farrar, Straus and Giroux (BYR), 9780374346355, 32pp. Lizzie loves to make up stories and tell them to anyone and everyone, even though now that her annoying baby brother, Marvin, has joined the family, no one has time to listen. She's so full of ideas, it seems like nothing can stop her. And then one day, something does. What's a star writer to do? Lizzie finds inspiration where she least expects it in this funny picture book, illustrated with energy and pizzazz by award-winning artist Tricia Tusa. Once Upon a Baby Brother is a 2011 Bank Street - Best Children's Book of the Year. 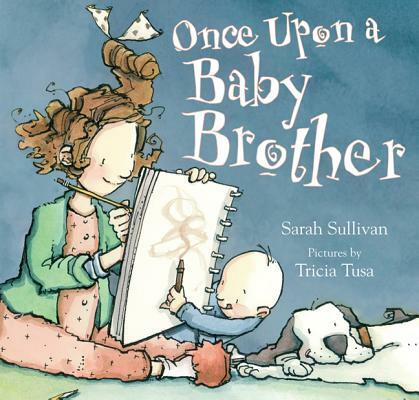 Sarah Sullivan is the author of Dear Baby: Letters from Your Big Brother, illustrated by Paul Meisel, and is author and illustrator of Once Upon a Baby Brother. She lives in West Virginia.